Be the first to share your favorite memory, photo or story of Danielle. This memorial page is dedicated for family, friends and future generations to celebrate the life of their loved one. 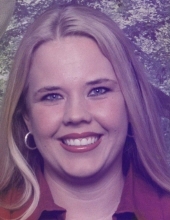 Danielle Stephens, a long-time resident of the New Braunfels area passed away on Wednesday, November 7, 2018 at Northeast Baptist Hospital in San Antonio at the age of 35. Danielle was born on December 14, 1982 in New Braunfels to Danny Ray Stephens and Lisa Cook. Danielle lived as a child in Angleton, Texas and loved volunteering at the nearby Ponyland. In the early 90's, Danielle moved with her mother to Palestine, Texas and spent the rest of her childhood and teenage years there, attending and graduating from Westwood High School. Danielle was very loving and kept up with friends from elementary school. Danielle loved arts and crafts and was very talented in that. And my, did she love rocks! She was very gifted academically and was very active in band, tennis and volleyball and the Westwood Baptist Church. Danielle was named Rotarian Student of the year and was in the Top 10 of her class both in High School and numerous years in college. In the early part of Danielle’s collegiate career, she was focused on veterinary medicine, but later changed to “human” medicine in the last five years, attending LVN school but unfortunately not graduating due to complications from pregnancy. Currently, Danielle was an honors student studying for her Bachelor's Degree in health and behavioral science and had less than a year left to complete. Survivors include her two sons, Carson Ray King and Cash Hardy; father, Danny Ray Stephens; mother, Lisa Cragg and husband, Doug; brother, Dean; grandmothers, Charlotte Abram and Elaine Meckel; grandfather, Maurice Cook, as well as many aunts, uncles, cousins and other family members both local and out of state. Graveside services are scheduled for 2:00 PM on Tuesday, November 13, 2018 at Hill Country Memorial Gardens. There will be a gathering at a nearby family home after the services. To send flowers or a remembrance gift to the family of Danielle Stephens, please visit our Tribute Store. "Email Address" would like to share the life celebration of Danielle Stephens. Click on the "link" to go to share a favorite memory or leave a condolence message for the family.